SPT0346-52 is a galaxy found about a billion years after the Big Bang that has one of the highest rates of star formation ever seen in a galaxy. Astronomers discovered this stellar construction boom by combining data from Chandra and several other telescopes. 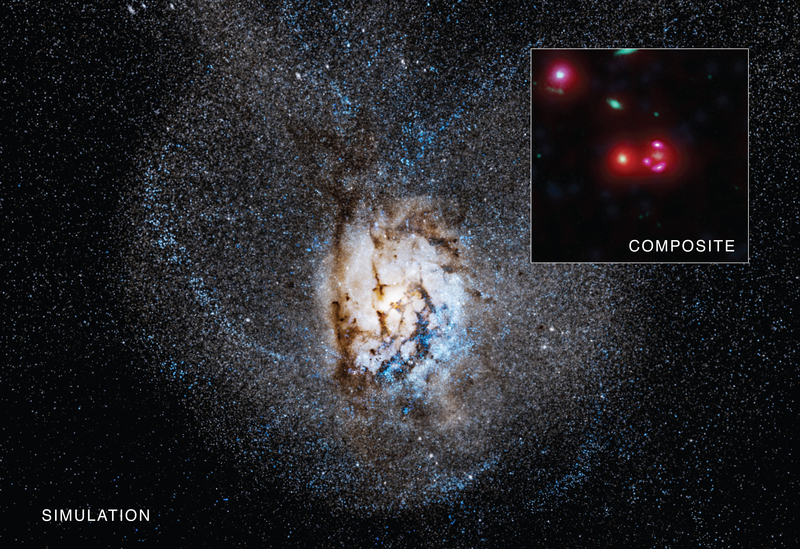 ALMA revealed this galaxy gave off extreme amount of infrared emission, which could have multiple explanations. Chandra's observations ruled out the presence of an actively growing supermassive black hole, bolstering the case of extreme star formation in this galaxy. This graphic shows a frame from a computer simulation (main image) and astronomical data (inset) of a distant galaxy undergoing an extraordinary construction boom of star formation, as described in our press release. The galaxy, known as SPT0346-52, is 12.7 billion light years from Earth. This means that astronomers are observing it at a critical stage in the evolution of galaxies, about a billion years after the Big Bang. Astronomers were intrigued by SPT0346-52 when data from the Atacama Large Millimeter/submillimeter Array (ALMA) revealed extremely bright infrared emission from this galaxy. This suggested that the galaxy is undergoing a tremendous explosion of star birth. However, another possible explanation for the excess infrared emission was the presence of a rapidly growing supermassive black hole at the galaxy's center. In this scenario, gas falling towards the black hole would become much hotter and brighter, causing surrounding dust and gas to glow in infrared light. To distinguish between these two possibilities, researchers used NASA's Chandra X-ray Observatory and CSIRO's Australia Telescope Compact Array (ATCA), a radio telescope. Neither X-rays nor radio waves were detected, so astronomers were able to rule out a growing black hole generating most of the bright infrared light. Therefore, they determined that SPT0346-52 is undergoing a tremendous amount of star formation, an important discovery for a galaxy found so early in the Universe. The main panel of the graphic shows one frame of a simulation produced on a supercomputer. The distorted galaxy shown here results from a collision between two galaxies followed by them merging. Astronomers think such a merger could be the reason why SPT0346-52 is having such a boom of stellar construction. Once the two galaxies collide, gas near the center of the merged galaxy (shown as the bright region in the center of the simulation) is compressed, producing the burst of new stars seen forming in SPT0346-52. 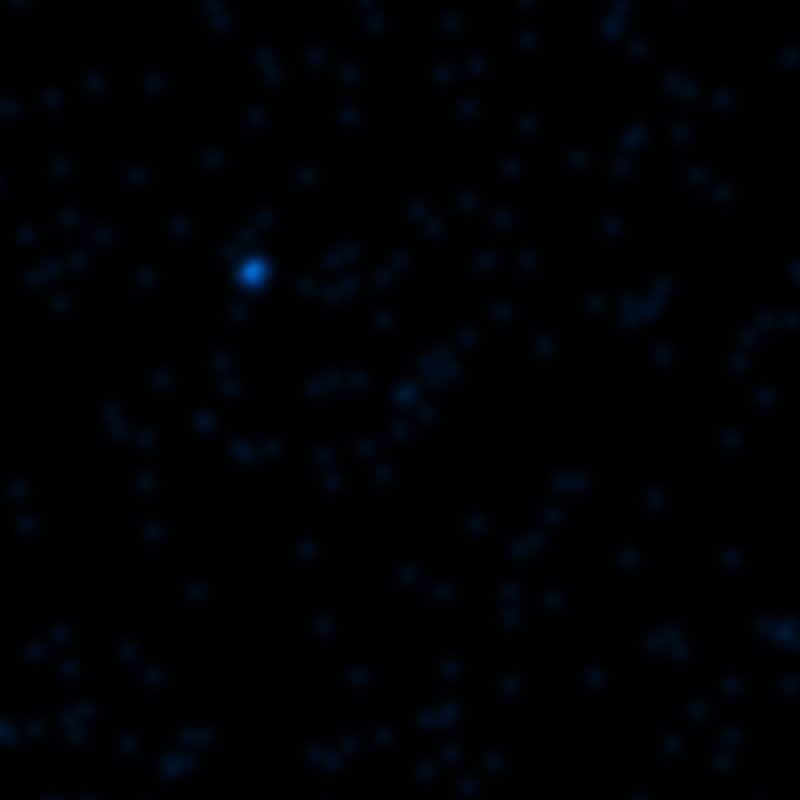 The dark regions in the simulation represent cosmic dust that absorbs and scatters starlight. The inset in this graphic contains a composite image with X-ray data from Chandra (blue), short wavelength infrared data from Hubble (green), infrared light from Spitzer (red) at longer wavelengths, and infrared data from ALMA (magenta) at even longer wavelengths. 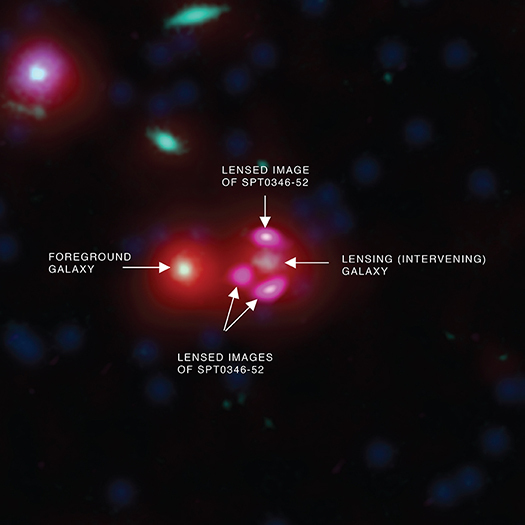 In the latter case the light from SPT0346-52 is distorted and magnified by the gravity of an intervening galaxy, producing three elongated images in the ALMA data located near the center of the image. SPT0346-52 is not visible in the Hubble or Spitzer data, but the intervening galaxy causing the gravitational lensing is detected. The bright galaxy seen in the Hubble and Spitzer data slightly to the left of the image's center is unrelated to SPT0346-52. There is no blue at the center of the image, showing that Chandra did not detect any X-rays that could have signaled the presence of a growing black hole. The ATCA data, not shown here, also involved the non-detection of a growing black hole. These data suggest that SPT0346-52 is forming at a rate of about 4,500 times the mass of the Sun every year, one of the highest rates seen in a galaxy. This is in contrast to a galaxy like the Milky Way that only forms about one solar mass of new stars per year. A paper describing these results, with first author Jingzhe Ma (University of Florida), has been accepted for publication in The Astrophysical Journal and is available online. NASA's Marshall Space Flight Center in Huntsville, Alabama, manages the Chandra program for NASA's Science Mission Directorate in Washington. The Smithsonian Astrophysical Observatory in Cambridge, Massachusetts, controls Chandra's science and flight operations. Coordinates (J2000) RA 03h 46m 41.13s | Dec -52° 05´ 02.11"
From what I have read and studied it seems that galaxies generally keep their shape and change only when merging or have already done so. There are dynamics that keeps a rotating galaxy in it's shape while the stars orbit the center of the galaxy traveling through the various arms. I do not claim to be an expert on this but do much reading and study on various areas of astronomy, astrophysics, and cosmology. I am wondering if anyone has any thoughts on or has done any modeling of what the galaxy looks like NOW as opposed to how we are seeing it, which is essentially what it looked like 13 billion years ago. What does it look like RIGHT NOW? If we were to be able to instantly travel to that area of space, how would it appear now, 13 billion years later? How wonderful, I've always enjoyed the images that show up on my email program. How do I get my grandchildren involved with the same? A galaxy found about a billion years after the Big Bang that has one of the highest rates of star formation ever seen in a galaxy. About about 12.7 billion light years. X-rays from Chandra, infrared from Spitzer, radio from ALMA, and optical data from Hubble. About 900,000 light years across. X-rays are blue, optical green, infrared red and radio purple.